Authors included on this page: Rattan Lal, Visti Larsen, J.C. Luthera, Dinesh S. Mathur, Satyanarayana Naik, Gopesh Kumar Ojha & Ashutosh Ojha. Visti Larsen's journey of the occult began with Western Astrology in 1998, and moved on to jyotisha or Vedic Astrology in the year 2000. He joined Sri Jagannath Centre in 2001 to learn astrology as taught in the lineage of Sri Achyuta Dasa of Puri, Orissa and at his guru's request became a jyotish guru and began teaching in 2002. Since then, he has spent most of his time traveling with his guru, Sanjay Rath, to conferences in the USA, UK and India. He has been learning directly from his teacher during this time, which has become the seed for this publication. The book starts with a testament: I, Visti Larsen, born to Kaj and Maymuna Larsen on November 21st 1981 at 6 am in Nairobi, Kenya. Grandson of Christian and Agathe Larsen as well as Ali and Fakir El-kindi... On pg. 324 he gives the time as 6:08 am. It's a nice book, has a lot of details, though I suspect they may be a bit thin. This is the second new book from Sagittarius publishers. Unlike Sanjay Rath's Collected Papers, there really is no good reason for the price. A note to Sagittarius: All other factors aside, a book must have a proper price, not too expensive, not too cheap (as if that's possible! ), in order to find the readers it, and its author, deserve. Skill 7: Astrology & other Vedic systems: 19. Ayurveda: the science of health; 20. Vastu: the science of space. Appendices: Supplemental Vedic astrology material; Glossary; Bibliography; Resources; About the author. CD-Rom & instructions for use. Comment: This is one of the best books to start a study of Vedic Astrology, but there’s more. Also included is a CD-Rom of Goravani Jyotish for PC & Mac. For a number of years, Goravani Jyotish has been one of the leading Vedic astrology programs. The CD-Rom version included with this program has limited functions (one chart at a time, no printing), but is otherwise easy, quick & accurate. Also on the CD: A guide to correct pronunciation of Sanskrit terms, another invaluable aid for the learner. Hay House, 417 pages, plus CD-Rom. 6. Comets; 7. Earthquakes; 8. Planetary cabinet; 9. Planets acting as lord of the year; 10. Effects of 60 lunar years; 11. Practical examples of interpretation of charts. Appendix: Indira Gandhi's chart, Indian independence chart, Pakistan independence chart, Chart for Gen. Zia-Ul-Haque. The chapter on comets includes notes by Varahirmira & a few of the comets he noted. The chapter on earthquakes includes various sets of rules from various sources, both western & Vedic (notably lacking: B.V. Raman). Planetary cabinet is an idea taken from the Kalaprakasika & includes King, Minister, lords of paddy crops, vegetation, minerals, clouds, grain & fluids, based on various ingress charts. Brief delineations are given for the planets for each of these positions. He describes a 60-year, lunar-based cycle, which would seem to relate to a similar 60-year Chinese cycle. As to where we are in the cycle at the moment, Luthra names Raktashi (#58) as the lunar year that began on 4 April 1984. That makes 2004 Tarana, a year of abundant rain & crops. 2005, Parthiva, would be a year of abundant crops & happy people. These are based on a year beginning with the new moon in Pisces, sidereal zodiac. Luthra delineates the 1984, 1987 & 1988 charts, for India. Extent of houses; Signs inimical to planets; Sambahdhas; Nodes - Rahu & Ketu; Relationship between a planet & houses; Relationship between planets; Arudha & divisional charts; Determination of relatives; Karakas, essential planets, factors & karaka properties; Signs; Nature of planets & houses; Elements of planets; Aspects; Strength of planets; Strength of houses; Basic characterization of houses; Constellations; Planets in signs; Marakas; Basic characeristics of ascendants. Some independent methods of timing; Major period analysis; Results relating to general significations of planets; House dependent results of the period of a planet; Results of planetary periods based on linkages. Sub period analysis; Inter period analysis; Inferior period analysis; Concise general method for determination of period results; Results of sub period of the major period planet; Relocation, incarceration & direction of journey; Effect of distance between major & sub period planets; Effect of specific sub periods; Principles to fix timing; Time of operation of a planet in its period. Traditional rules for transit analysis; Transit ruler of the band of years; Transit of the period planet; Transit of the karaka; Transit of the Sun; Transit of the Moon. This is the first work in which an attempt has been made to scientifically put to practice concepts relating to progression only hinted at in Bhrigu Samhita of the hoary past. This is a unique attempt that has been successfully employed to time events correctly. The question of timing of events has remained unanswered for long. It has been said that only with a well developed sense of intuition can an astrologer correctly predict the time of happening of an event. The author in this book has shown that with correct application of classical techniques it is possible to predict an event accurately. These techniques have been enunciated with clarity in this book and their use has been explained lucidly with charts drawn from real life. For what the author means by "progression", see the notes on Vedic Progressions. 7. How to interpret the progression of the major period planet in an annual chart? When we talk of Vedic Progression it means advance or retreat of a planet at a fixed pace through the houses. The planet forms relationships with natal karakas (significators) and houses during such motion. Such developing relationships point to likely events in the future. In Vedic progression, planets move from house to house at a fixed pace and when they form relationships with karakas and houses they materialize events. These relationships are generally not based on aspects. They are formed by occupation of a house, constellation or navamsha. They are also formed by association or sambandha. The movement of a planet could be forward if it is in direct motion at the time of birth, or backwards, if it was retrograde at that time. The forward movement is called progression, the backward, retrogression. In Chapter 3, we learn a progressed planet spends as many months in a sign as it spends in years in Vimshottari maha dasa, which the author suggests reducing to days for accuracy. This is a variation on the western minor progression, which is a month for a year swap. On page 70 is a handy table. From it, we learn that during its major cycle, progressed Venus spends 20 months, or 608.76 days in each sign, or 20.29 days per degree. The progressed Sun, during its mahadasha, spends 6 months, or 182.63 days in each sign, etc. When a progressed planet comes in contact with a natal karaka, it tends to give results according to the karkaka. The author says his book seeks to combine the north Indian Bhrigu Samhita, with the south Indian Nadi Granthas. Comment: This is a nice introductory book. It won't make you a Vedic astrologer, but, presuming you learn the basic chart formats, it will give you a nice idea of what they're up to. It might even encourage you to go further. Horoscope prepared for conventional system remains unaltered & used in Naadi system. No house divisions are required for Naadi system. The utility of lagna will be in a different context in this system. Significations of twelve signs & nine planets are essential parameters to study Naadi astrology. Conventional rules of planetary aspects are replaced with "Sambandha" relationships links of planets from different places. Planets in trine establish close relationship similar to conjunction. A planet in a sign will undergo modifications as per the planets posited in 2nd and 12th sign from it. The signification of a planet in the 2nd sign indicates the nature of matter & the planet in 12th sign will indicate whether it is supported or not. Similarly hemming to be studied within the same sign. A planet in 7th to the planet under consideration will indicate the modification of the matter in question. A planet ahead will give its signification to the planet posited behind it. 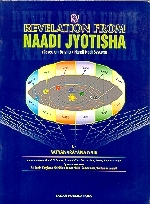 The art of prediction in naadi system is to logically combine the karakatwa (signification) of planets & signs to a particular planet indicating the desired matter. Every matter in life is represented by a planet. The grouping of planets is done by directional chart which is explained as the appropriate place. A group of planets in a particular direction constitute a yoga (combination). Transit of major planets, Jupiter, Saturn, will indicate the fructification & nature of such yoga. Rahu & Ketu will indicate distress in yoga. The planetary dignities like exaltation, debilitation, retrograde, exchange of planets, dispositor theory, sign activation through lord, lord activation through sign & relevant relationships are all considered. Planets in friend's and enemy's sign are considered for their strength. The friendship & enmity among planets, slightly vary from conventional method & this is the most important factor to arrive at correct predictions. The chart drawn at the time of consultation is important for analysis of any chart. Easily the most comprenhensive exposition of R.G. Rao's Naadi system. Contents: Preface; 1. What is astrology; 2. The birth chart; 3. Signs; 4. Houses; 5. Planets; 6. Planets in signs; 7. Planets in houses; 8. Judging the chart; 9. Planetary periods; 10. Timing of events; 11. Transits. Appendices: 1. Table of the precession of the equinoxes & nutation; 2. Ayanamsa, 1976-2032; 3. Sanskrit terms; 4. Astrological terms. Comment: A useful introduction to Vedic astrology. Contents: Preface; Introduction; 1. Conjunctions of two planets; 2. Conjunctions of 3 planets; 3. Multiple conjunctions; 4. Aspects of Sun, Moon & Mars; 5. Aspects of Mercury & Jupiter; 6. Aspects of Venus & Saturn; 7. The ninth house (conjuctions of 2 & 3 planets in the 9th, Jupiter in the 9th); 8. The Moon sign (planets in the 10th house from the Moon); 9. Important combinations for health, longevity, heart, mind, relations, friends & enemies, marriage, wealth, luck, real estate, vehicles, status, position; 10. Judgment guidelines. Appendices: 1. Influence of planets; 2. Influence of Uranus; 3. Effects of Neptune. Comment: This was earlier published in the US by Passage Press. It is now published in India. Introduction: How do we proceed to calculate; What is a solar return; 1. Joys & sub-divisions; 2. First principles; 3. The Lord of the Year; 4. Muntha & sensitive points "SAHAM"; 5. The sixteen yogas; 6. Tripataki Chakra; 7. The timing of events; 8. Guidelines to interpretation; 9. Health & illness; 10. Wealth, love & family; 11. The worldly game; 12. Horary astrology. Appendix: Calculations of house divisions; Tables of balance of vimshottari dasha & antardasha; Glossary; Index.